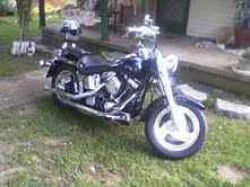 The 1997 Harley Fatboy for Sale has many custom aftermarket parts(it's chromed OUT!) and low mileage of just 3000 miles! Check the list below to see all the nice extras and features on this custom 1997 Harley Davidson Fatboy. The bike has brand new tires with less than 50 miles on them! If you're interested you can e-mail me using the comments form and please mention that you found my ad on GoGoCycles Used Harleys for Sale. GoGoCycles encourages our visitors to submit a review of the 1997 Harley Fatboy for Sale to help potential buyers make informed decisions and to benefit the biker community as a whole. If you think that you might want to buy the Fat Boy or have questions please email.